I paid $15.99 for this record. Billy Bragg is a relatively recent love of mine and a fitting segue into the punk rock retirement plan of folk or Americana songs. I enjoy his interpretation of acoustic folk with electric guitar and his rich English accent. His politics are the rational punk politics I grew up on, yet more refined while being just as passionate. This record, in particular, shows his growth from a brash youth to a wizened role model. The drawback to this particular release is a wandering through various genres instead of the solid guitar + vocal sound that made Bragg unique. He had started to explore other outlets on previous releases, but really is all over the map on William Bloke. This might have been made more cohesive by a better song order, perhaps following an emotional or story arc, but there are still some great songs on this disc. The record begins with the Bragg equivalent of the straightedge fall from grace song. Instead of the hardline anger towards the fallen, Billy pairs up with a solemn organ tone to provide a slightly disappointed view. Classic sentiments like "...the ideals you've opted out of, I still hold them to be true" provide lefties like me with a hope that we can keep our ideals strong as we progress into our middle age. "Upfield" feels like a celebration of sustaining the beliefs of your youth into middle age. The general trend (in the US at least) is that the older you get, the more "iron fist" you become. However, Billy maintains his "helping hand" politics to this day and track 2 of this record is the dance party for his perseverance. The unfortunate thing about middle age is that sometimes your tastes are just outdated. Looking back isn't always the best and record really takes a dip on tracks 3-4 as Billy tries a bit of Tony Bennett style crooning and then a reminiscence into Doo Wop territory. Luckily he doesn't stay long and gets back out the fist shaking on an interpretation of a Rudyard Kipling poem that oozes English protest. Finishing up the front side is the stellar "Brickbat." I feel like people were waiting Bragg's whole career just for him to deliver the phrase "in the supermarket" at the start of the third verse. I fall in love with tiny parts of songs and this note choice for this phrase is a perfect moment. This is an amazing and tender love song for his family and reaches the highest plateau of songwriting in my book: the combination of impeccable melody with absolute honesty. "I used to want to plant bombs on the Last Night of the Proms" is an introduction to an unforgettable chorus. On the B-side, Bragg brings us his version of a Paul Simon song in "The Space Race Is Over." He follows that with a folk love song for working towns, a lilting and sugary love song, some sleepy Americana, and finishes with a weird almost-reggae pop number. While "The Space Race" is decent and lines from other tracks like "Trapped in a haircut he no longer believes in" are wonderful, the back half of the record lacks some punch after the greatness of "Brickbat." The different styles of songs make the experience harder to get into as well. 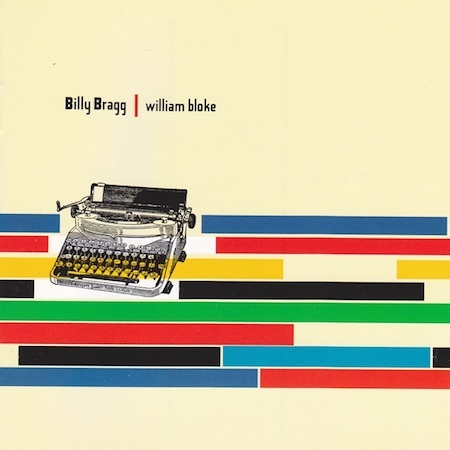 However, if you're a Billy Bragg fan, this is a good addition to your collection.